This is a quick and simple post on the Dow Jones Utility Average (DJU), which is testing a clearly defined UP trendline from its lows in 2009. We say clearly defined as it has been precisely touched by lows in 2011 and 2014 (and almost in 2012). Thus, it meets our criteria for a valid and relevant trendline as it has had at least 3 prior touches. The Utility Average has spent much of the past 8 days treading this trendline, around 544. Now, we never want to anticipate a breakdown. Therefore, we will assume the trendline holds as support until it doesn’t. However, there are a few things that make us skeptical that the trendline isn’t going to be broken relatively soon. For one, the DJU has already broken down below significant Fibonacci support in the vicinity of 575. And after an ill-fated attempt to regain the level in August, it is back down below there. Secondly, the DJU has had difficulty thus far mounting any kind of a bounce off of the line. In previous touches, the index had bounced almost immediately. The longer the index rests on the trendline, the more likely it is to break, eventually. Lastly, the index certainly has had company in terms of indices or securities breaking major trendlines lately. After a 2-year straight-up rally, we have witnessed a plethora of significant trendlines being broken lately. So while it would have been perhaps surprising to see such a trendline broken in 2013 or 2014, it would be much less of a surprise now. Should the trendline indeed break, the next significant level of potential support, in our view, comes near the 520 level. This area represents a breakout level of sorts above the 2007-2008 peak as well as the 2013 highs. That level also lines up with the next cluster of Fibonacci Retracement support from the key lows in 2009 and 2012. Should the trendline break, that 520 level could come pretty quickly. So that’s it – short and sweet. 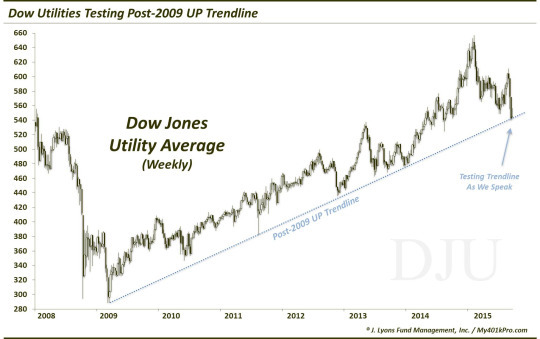 As long as the Dow Jones Utility Average remains above its post-2009 UP trendline, its prospects are bullish. Should the trendline fail, it opens up the 520 level for testing…and quickly.